Water, methane and carbon monoxide have been detected in the atmosphere of exoplanet HR 8799 b, the structure of which surprised scientists when it was discovered a few years ago, as its parameters contradicted all previous theories. The discovery across the K band was made by US and Canadian scientists. Most of the absorption lines found were produced by carbon monoxide and water, but several of the detected lines were from methane. HR 8799 b is one of four so-called ‘gas giants’ which orbit the star HR 8799, located 129 light-years away from Earth in the constellation of Pegasus. It is approximately 1.5 times the size of the sun and about five times brighter. Though it is the smallest of all HR 8799’s planets, its mass is still seven times greater than that of Jupiter, the biggest planet in the solar system. Its radius is also one-third larger than Jupiter’s. Due to thicker clouds in its atmosphere, HR 8799 b is higher than it should be, considering its age and the energy it produces. The HR 8799 planetary system has attracted special attention from scientists, as the orbital radiuses of planets e, d, c and b are two to three times larger than those of Jupiter, Saturn, Uranus, and Neptune, respectively. The star HR 8799 can be viewed even by the naked eye, and is easily seen with binoculars. HR 8799 b was discovered in November 2008. It is one of the few exoplanets to be snapped by telescopes, as the existence of others have been mostly proved by indirect methods. Scientists observed the planet via the Keck II telescope, located in Hawaii. 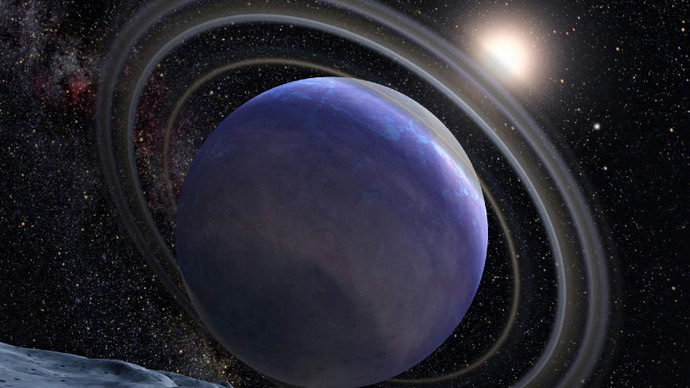 Direct observations of extrasolar planets became possible just a few years ago. The first ever photo of an exoplanet was made in 2008, and the first direct imaging experiment took place in 2010.